Fitness Tracking Bands are becoming very popular these days and you can easily find one on everyone’s wrist, running or jogging in a park. The fitness trackers offer great portability and ease of access to the user as they give you a whole lot of information about how many steps you have taken, calories burned, heart-rate which is very helpful in tracking your fitness journey and keeping records. If you set out to buy a fitness band for yourself, then you are likely to commit a blunder as there are very misleading ads and descriptions that will definitely trick you into buying them. There are a lot of brands that sell fitness bands and not all of them are worth the money they charge. But don’t worry, you won’t have to waste your time going through all the options, just read this article till the end and you will have your answer as to which is the best fitness band under 5000 in India, 2019. If you are spending 5K then you are looking for best as this is a high rate for Fitness bands and at this rate, your expectations go a bit high. This is the rate where are going to have high end features auto activity record etc. The GOQii 2.0 comes with the subscription to a doctor who checks the data and acts as a personal coach, which makes it the best fitness band under 5000 in our list. It is the only fitness band which comes with NFC. The biggest positive point of this fitness band is that it comes with a 1-year subscription to doctor who analysis your data and make a report. One of the major advantages to the Goqii band 2 is that you can plug it in your mobile phone travel charger or a computer’s USB port to charge it up. The size of the watch is compact and fits on hand easily. GOQii is having the most advance Health Sense PD-102 sensors for accurate step measurement. This is only Fitness band under 5000 which is having NFC. It comes with an Integrated USB charger that allows you to connect the device with your computer or laptop without having to carry a separate charger. The GOQii is light weighted. Your wrist is not even going to realize the weight of the band. The band is resisting to dust and water. The look of GOQii is simple and it looks just ok on hand. The Garmin Vivofit 4 is the best fitness band in our list of 5K for battery lovers as it comes with 1 year plus battery life which means you don’t need to waste time while charging it. The biggest positive point of the Garmin Vivofit 4 is that it comes with a battery life of 1 whole year, so you didn’t need to waste time while charging it. Vivofit 4 is having great colored LED display, which makes it special. 5 ATM waterproof which makes it perfect while running or at GYM or even while swimming. It can measure swim at 5 ATM also which make it a bit special in our list. You can keep a record of your activity up to a month. Garmin Vivofit 4 can be connected to a smartphone via Bluetooth and you can see your progress while using The Garmin App. The fitness band looks great on hand and is lightweight. Move IQ. That means you won’t need to manually start an activity before your workout. It auto-detects activities like walking, running, biking etc. USB integrated charger present on a device. Fitbit Flex 2 is also an excellent fitness band to track your daily activities. It is thinnest fitness band in our list. It can also be used as a pendant, which makes it a stylish fitness band in our 5000 Rs Best fitness band. The Fitbit Flex 2 is very attractive and looks beautiful on the hand. Smart activity tracker which tracks activity without manually setting it. There are 5 LEDs to show the activity progress. The Fitbit is very light weighted and feels very comfortable while wearing it. There is Alarm Clock, Reminders and Social Integration reminder which will be shown if you are connected to the phone via Bluetooth. The Fitbit is having great built with a great criss-cross design. The Fitbit take cares of fashion as it comes with Pendant case, this elegant pendant hangs gracefully while tracking your steps, distance and more. You have to install App to view the activity progress as there is no display to show these things. No Heart rate monitor and no GPS. Honor band is having the largest display with Brightness adjustment fitness band in our list of best fitness band under 5K. This is the only smart band which comes with Scientific Sleep Monitoring. The Honor Band 4 comes with a 0.95-inch AMOLED display with a resolution of 128 x 80 pixels. There is an embedded touch-sensitive under the display glass. The touch button allows users to ignore or decline calls when they are busy. It also lets users go back to the home screen. The Honor Band 4 lets users not just receive messages but also read them. The band alerts users about an incoming call or message. Belt clip design makes band firmly attached to your wrist. Honor says the Band 4 is water-resistant up to 50m up to 5ATM. The Band 4 Gives you Accurate record of Step walked and Slept time with the help of Scientific Sleep Monitoring. The Honor Band 4 offers you control over Music and camera Shutter. Honor Band 4 also offers features like stopwatch, find your phone, alarm, heart rate monitor, speed, and sleep tracking, among other things. The band 4 is having a good battery life of 17 days. Comes with a warranty of 1 year. The band is having a basic design. Mi Band 3 has 193 ppi which is the highest ppi in all fitness band under 2000. The Band 3 comes with a 0.78-inch OLED display with a resolution of 128 x 80 pixels. There is an embedded touch-sensitive under the display glass. The Mi Band 3 lets users not just receive messages but also read them. The band alerts users about an incoming call or message. The Mi Band 3 shows a 3-day weather forecast and comes with a unique 2.5D curved design which makes it easy for users to wear it throughout the day with ease. Xiaomi says the Mi Band 3 is water-resistant up to 50m. Mi Band 3 Gives you Accurate record of Step walked and Slept time. The Mi band 3 offers you control over Music and camera Shutter. 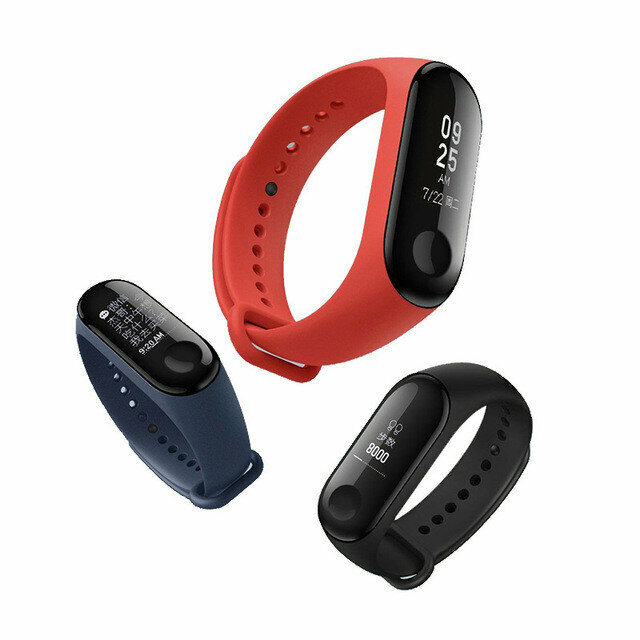 Mi Band 3 also offers features like stopwatch, find your phone, alarm, heart rate monitor, speed, and sleep tracking, among other things. The Mi Band 3 packs a 110mAh battery inside that, which is powerful to power it about two weeks which is great. Mi Band 3 is having a basic Design. The Lenovo HX03F has a colored display which is a very unique offering in top fitness bands below 2000 Rs. Active Heart Rate Monitor is a high-end feature. In terms of features and additives, the Lenovo HX03F ranks first in our list of top 5 best fitness bands under 2000 with heart rate monitor, but it does have its shortcomings, we have listed all the pros and cons of this band. Active Heart Rate Sensor tracks pulse at 15 min intervals. This Dynamic Pulse Tracking helps to get a better idea of your heart health and resting heart rates. The accuracy is also great with hit-rate being about 90%. The HX03F Spectra is feature loaded but still feels lightweight and sits comfortably on your wrists. The material feels ok against the skin and can be worn 24*7 without skin irritations. There is IP68 Rated waterproofing, so you can easily take the HX03F for a swim or sweat on it while working out, it will work perfectly through all those conditions. Sleep Tracking is very accurate. The Lenovo HX03F tracks how deep you slept and the data is very accurate and spot-on. The TFT display is dim. The 0.96″ display on the HX03F is not bright enough to be seen easily under direct sunlight. An OLED panel would have been better in this area. The Pedometer(step tracking) is not accurate. The no. of steps count on the HX03F is of average accuracy and given the other sensors, we hoped this too would be fairly accurate. So this was our list of the Top 6 Best Fitness Bands Below 5000 in India. Top 6 Best Fitness Bands under 5000 Rs- How did we prepare this list? There are many bands that come for that price and offer premium features at a budget price. The 5000 Rs mark is flooded with options that offer average to premium features and we went with only the most productive ones so that you don’t have to regret buying the wrong one. We have placed the Fitness Bands on our list based on their features, accuracy in measurement, wearability, and durability. Only the best ones that would actually benefit the wearer have made it to the list. If you are paying 5000 Rs then you would expect your band to have decent battery life, social integrations and more. We tested out each of these bands and exposed them to the conditions they would normally undergo in average day-to-day life. How much do you like the post “ Best Fitness Bands to buy below Rs 5000 2019”? Also, If we have missed a favorite resource of yours, please add it below in the comments. We love looking up new avenues of inspiration from you. And Don’t forget to share the topic ‘Top 6 best fitness bands under 5000′ on social networking site because this might be helpful to other.